Strong: JPY, CAD, CHF. The preferred range is from 6 to 8. Average: USD, AUD, NZD. The preferred range is from 3 to 5. The comparison table provides a way to compare currencies from a longer term perspective of 13 weeks and also simultaneously taking the current trend into account. 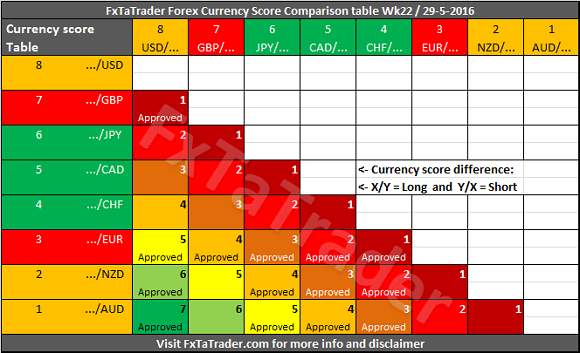 By coloring the currencies in the X and Y axis according to their Classification, see "Forex Currency Score Classification for Wk20", we can show what the best combinations are. In doing this we apply 2 rules to make it clear. AUD, NZD and the EUR. USD, GBP, AUD and the CHF. AUD/CAD, AUD/JPY, AUD/NZD, AUD/USD, CHF/JPY, EUR/AUD, EUR/JPY and the USD/CHF. AUD/CAD, AUD/JPY and the AUD/USD. 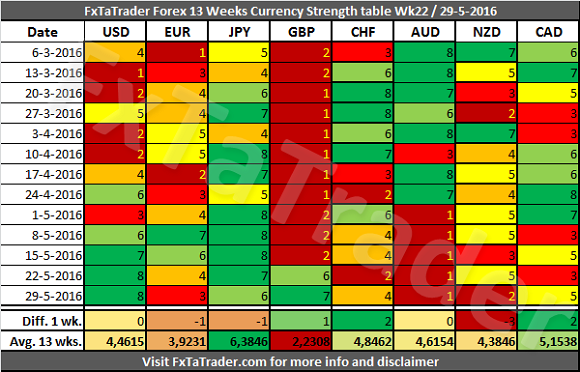 The AUD/NZD, CHF/JPY, EUR/AUD, EUR/JPY and the USD/CHF are not mentioned as "Approved" pair in the "Currency Comparison Table". The EUR/JPY and the USD/CHF are not mentioned in the Top 10 of the Ranking and Rating list. Only the AUD/JPY and the AUD/USD seem to be interesting according to the combinations mentioned in the crossed join here above. Same for the "Currency Comparison Table", only the AUD/JPY and the AUD/USD are mentioned as "Approved".